« Woolly jumpers and bodices – of the liberty kind! Accessorising – well, you don’t have to go completely overboard like Iris Apfel who, at 92-years-old, is perhaps the most famous fashionista there is and has made enormous bracelets and glasses her signature look. Nor do we have to go quite as far as Sue Kreitzman (one of our Fabulous Fashionistas) who wears accessories as an art form. I saw Sue at Mirror, Mirror creating a look for Alyson, the blogger of That’s Not My Age, and the accessories that completed the outfit, made by Sue herself, were both extraordinary and wonderful. In fact, I wear far more in-your-face jewellery items these days than I used to because when I was younger an over-abundance of jewellery was inappropriate at work. Now, not exactly the sky’s the limit but, people, what is there to lose! There’s a pic of me with my green rings plus quite noticeable age spots in Lorna’s film – bring it on, is all I say! Joy Fox is a jeweller I admire. 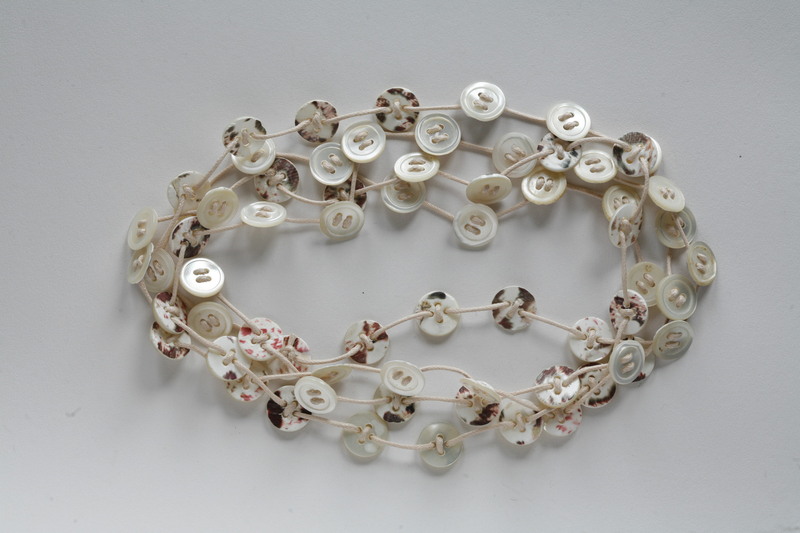 She has an interesting take on making an impact, and specialises in button jewellery. Here is just one of her pieces. I have many of her button bracelets and necklaces in lots of different colours – practically, one for every outfit I have – and they’re very reasonable priced! Joy lives in Brighton, East Sussex and is selling her wares in an ‘Open House’ over the next two weekends 7/8th & 14/15th December. She doesn’t have a website but you can reach her through the Open Houses website – look for house no. 38, Winter Fox. 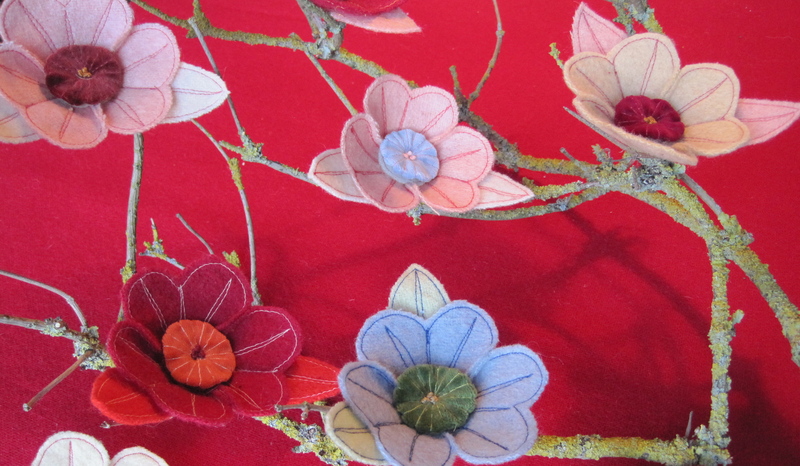 She also does some lovely felt corsages and I have two of those. Another thing to think about for a glam night out is why not match a sparkling pair of shoes with a sparkling belt? And if you’re short of cash don’t forget that charity shops have an abundance of jewellery and other accessories at very low prices. And then there is make-up. You know, I still wear a lot of make-up. Can’t not. It’s embedded in my genes with the still, small voice of my mother still ricocheting around my skull saying, ‘mustn’t go out without putting on my face’ (which for her was plucked eyebrows, white floury powder and a bright red lipstick). And I come from the generation that drew that extra line around and slightly above the eye socket – was that the late 60s? I think we have to change our idea of make-up just a little when we age, though. But go no further than this wonderful YouTube clip from Tricia Cusden advising the mature woman *coughs* on how to highlight your eyes and lips. For years I have been stuck in a dark eyes and pale lips mode but have moved myself on to Tricia’s plum lipstick (available from her website) which is to die for, and looks wonderful in both daylight and for that special evening out. I’ll return to the business of make-up again in the Spring but that’s all for now. Next blog and probably the last one before Christmas – more frocks for the party season! P.S. Here’s Hadley Freeman‘s take on Christmas jumpers – very funny! Thank you Penny for some great ideas – your blog had me zooming off in all sorts of wonderful directions as I followed all your links. Really appreciated the focus on eye make up – a current dilemma as I am finding winter wreaking havoc with fine ageing skin round eyes. By the way, I love that little film, Lorna;s Film. It is what drew me in to the same excitement you have about clothes. I am not quite as adventurous as are you, but I have found some lovely pre-used items and discovered a new confidence to weed out my closet, wear what actually fits well now, and to experiment a little in colour. Your ideas are very appreciated. Yes, Lorna’s film is great isn’t it. By the way, Lorna has continued to make films (I was the first) and some of them can be seen on this link http://www.pottedfilms.com She is a freelance consultant specialising in social & health policy and older people and aims to use the films she makes to tell their story.